Playa Vista Martial Arts is a Martial Arts School offering Kung Fu & Kung-fu San Soo classes in Los Angeles, CA for kids, men and women. 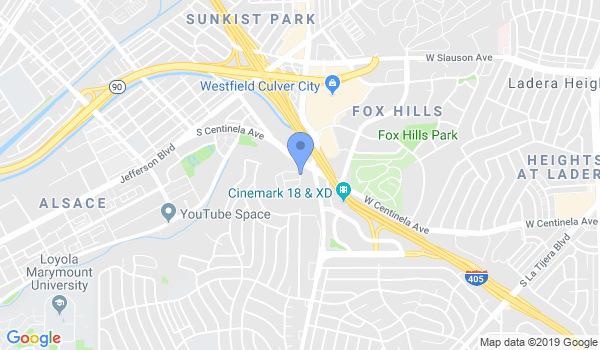 Playa Vista Martial Arts is Located at 6516 Arizona Ave.
View a Location Map, get Directions, Contact Playa Vista Martial Arts or view program details below. If you are a student at this school, help your local Martial Arts Community by writing a Review of Playa Vista Martial Arts. You can also help your school by sharing it on Facebook, Twitter, Google+, Pinterest etc. We offer ongoing group classes for adults and for children. Our children's program is unique and offers character and leadership building curriculum in addition to teaching kung-fu. Our anti-bullying program focuses on how to communicate in stressful situations. We offer special seminars, including anti-bullying, senior self-defense (cane fu) and women's self-defense, at our location, and at other places around our community upon request. Private lessons are also available. Playa Vista Martial Arts proudly serves the Los Angeles communities of Westchester, Culver City, Marina Del Rey, Playa Del Rey, Ladera Heights, and Playa Vista, as well as attracting students from farther away. The current group class schedule is available on our website. Would you like more information on hours, classes and programs available at Playa Vista Martial Arts? Please contact the school with your questions. Update the details, Write a Review or Report Error of Playa Vista Martial Arts. View all Dojo in Los Angeles or in Zip code 90045.